Les Munro was a war hero and an outstanding local government leader. Bill Conroy salutes a true gentleman. John Leslie (Les) Munro, CNZM, DSO, QSO, DFC, French Legion of Honour, the last surviving dambuster pilot, died in Tauranga on August 4 this year aged 96. More than 600 people, including senior officers of the New Zealand Defence Force, gathered to honour and farewell Les at a service held at the Classic Flyers Museum in Tauranga on August 8 where the cortege was saluted by a flypast of five classic aircraft. It was a fitting closure to what had been a full life, much of it directed to the service of his country and his community; and all of it against a background of his devotion to his wife Bet and their close and loving family. Just how close that family relationship was is clearly shown by the fact that 10 of Les’ grandchildren acted as his pall-bearers. Les Munro was a humble and unassuming man and, away from the public eye, he was somewhat bewildered by the attention he received as a result of his service with the RAF 617 Dambuster Squadron. Les never forgot the men who had served with him during the war years – and particularly his comrades who flew and died with the Dambuster Squadron. Les flew 58 combat missions during WW11 before he was appointed to command a bomber training squadron. It is interesting to note that in that role Les learnt to fly the Hurricane fighter plane in order to be more closely involved in the training of new bomber crews. He ended the war with the rank of squadron leader. Les travelled to the United Kingdom on a number of occasions up to 2013, when he was 94 years of age, to attend dambuster events and he saw those trips as an opportunity to remember and honour his fallen comrades. I was able to be with Les on several of those visits and saw at first hand the sense of occasion that he displayed and, just as importantly, witnessed the respect and honour accorded him by the British public. Clearly he was held in the very highest esteem. 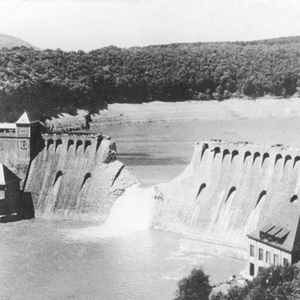 The Eder Dam, 1943, after the Dambusters’ attack. Commencing in 1961 Les had a long involvement in local government beginning as a member of a rabbit board, continuing as a county and district councillor and chairman, and ending with his retirement in 1995 as mayor of the Waitomo District. For a number of years Les was involved in local government affairs beyond the boundaries of the Waitomo District. In February 1988 when Zone Two of LGNZ was formed, covering Waikato, Bay of Plenty and Gisborne regions, there were 39 constituent members comprising city, borough and county councils, and other ad hoc authorities throughout the area from Raglan to the East Coast. Because of the respect and trust which his contemporaries had for him Les, even though he represented a relatively small district council, was elected chairman of Zone Two. He continued in that role without challenge until his retirement in 1995. And again: “During the months leading up to and immediately following the release of the Local Government Commission (LGC) reorganisation proposals Mr Munro was unflagging in his efforts to support Zone Two members in getting to grips with the consequences of the change process. The Waitomo Cultural and Arts Centre in Te Kuiti is being renamed and rebranded as the Les Munro Centre in his honour. Les was a man who was loved, admired and respected, and he is mourned by those who knew him. We salute and farewell a true gentleman.